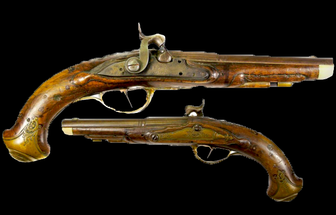 German gentleman's flintlock-to-percussion pistol, ca.1760-1780. 626 grams, 13-1/4" long. 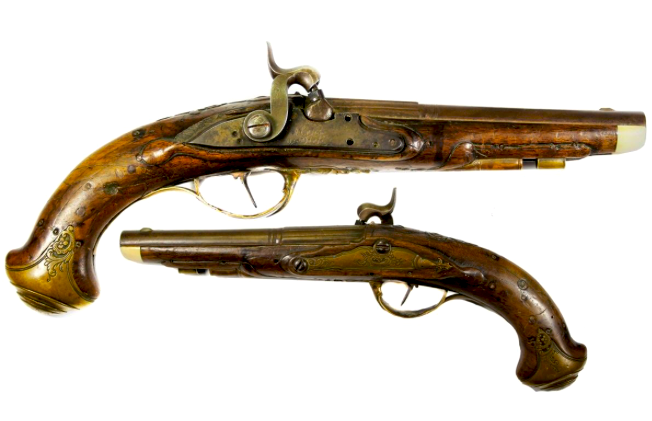 A high-quality gun that must have belonged to an officer or a wealthy civilian, originally a flintlock but converted to percussion, with maker's mark "alen a. dietz" signed on the lockplate, turned and fluted barrel (brownish in color, 7" long), walnut stock with carved decorations and ornate brass mounts (trigger-guard, buttplate, sideplate and ramrod holder, the ramrod typically missing) and ivory fore-end tip. The lock appears to be complete with operational trigger. With certificate & pedigree.